Hello! 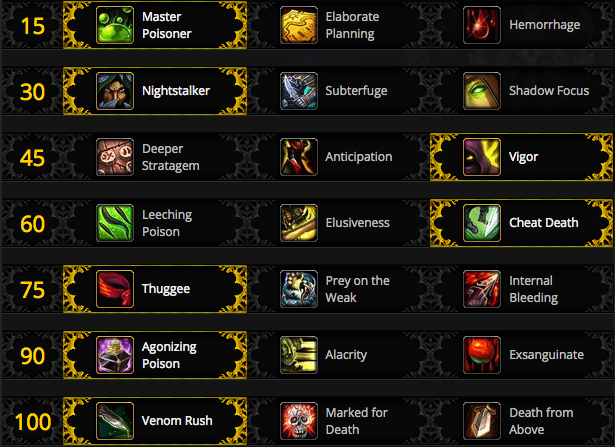 I’m Kistler, from Damage Networks-Stormrage, and welcome to NH-Tips & Tricks. Ravenholdt.net used to house continuously updated, community-driven Tips & Tricks threads for each encounter within a raid tier, and I’ve personally rather missed having such guides as references. 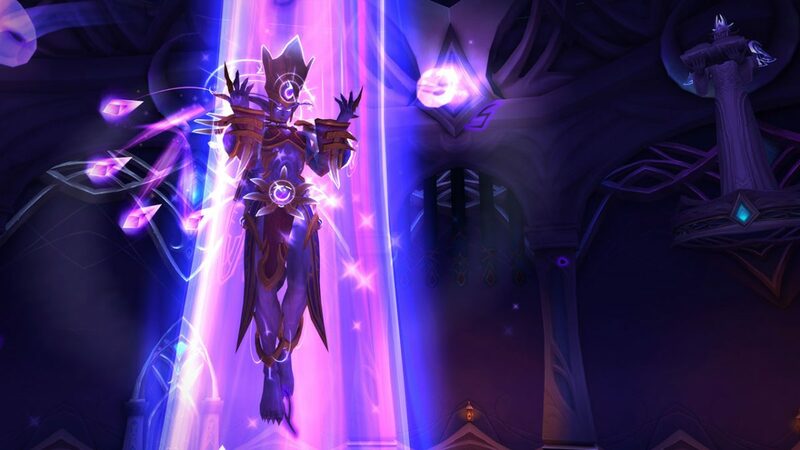 With the Rogue community as active and communicative as it is today, the time felt right to resume this practice for the Nighthold (and beyond!). I have omitted several (not enough?) interactions I think trivial, to avoid cluttering this post, but if I have left anything out you think important, please let me know. This post will be regularly updated with further input from you all and as I further experience mythic encounters. Please comment any suggestions (“You FOOL! You forgot to mention xyz! ), questions (Does insert racial ability here work on xyz? ), or corrections. 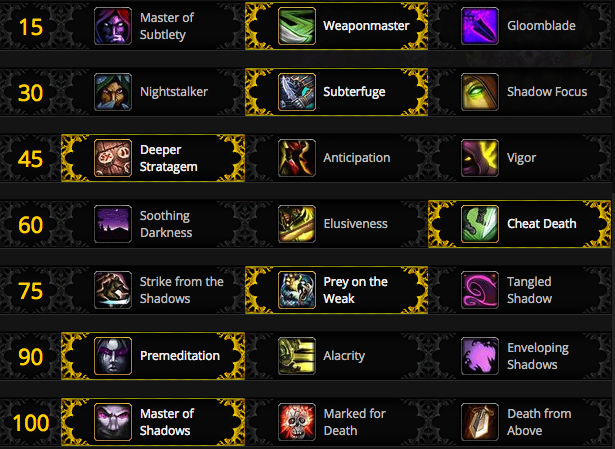 Highlighted mechanics still need confirmation…halp! CloS removes Soul Siphon; does your soul remain in well, needing to be soaked? CloS prevents damage from Flames of Sargeras and Desolate Ground; stack it up! 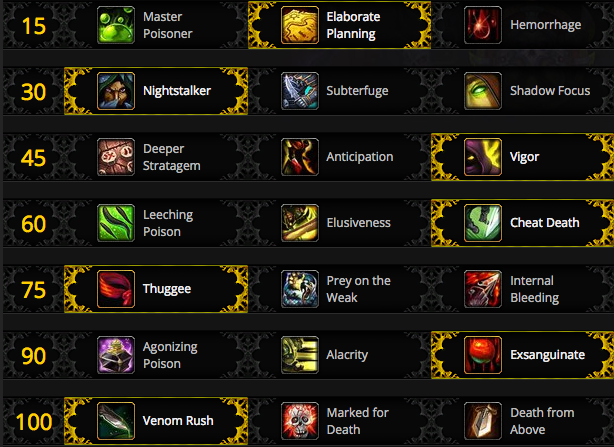 In the most recent 7.1.5 hotfix applied on January 31, 2017 Blizzard has changed Kingsbane so that it no longer double dips from Agonizing Poison. This was a bug that needed to be fixed but it also represents a sizable nerf to the damage of Kingsbane. Depending on the amount of mastery that you had Kingsbane was doing anywhere from 9-16% of your overall damage on the fight. Because Kingsbane is no longer double-dipping from Agonizing Poison we can estimate an approximate 45-50% damage decrease. This was obtained by looking at some post-hotfix logs as well as using napkin math. Using very rough napkin math we can estimate an overall 5-7.5% damage decrease. 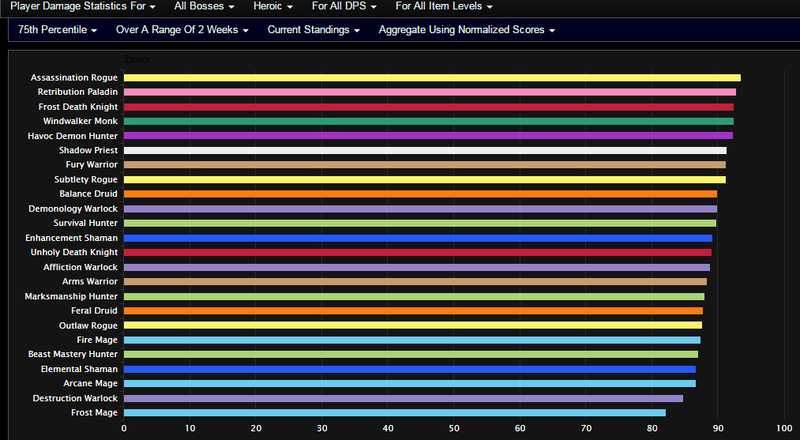 Despite an overall 5% damage nerf Assassination Rogues are still one of the best DPS specs in Nighthold. Greenskin’s has undergone a series of nerfs on the PTR builds for patch 7.1.5. First from 400% to 300% and now from 300% all the way down to 200%. 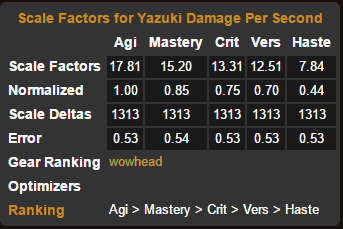 Now, I can empathize why you would be upset if you had this legendary and were concerned about your DPS decreasing drastically…..but the simple fact is that these bracers were too strong. Greenskin’s is an often misunderstood legendary. Many don’t realize it’s potential. But, it’s actually the legendary with the biggest single target damage increase for all of the rogue specs. Before the nerfs Greenskin’s was adding at least a 25% increase in ST Damage. Whereas, most other legendaries are around a ~10% damage increase. Firstly, you take the Quick Draw talent instead of Ghostly Strike. True Bearing becomes your most valuable buff by a large margin. Use Between the Eyes on cooldown give that you have consumed the previous buffs. If you have a Blunderbuss proc and Between the Eyes is off cooldown, you save it until you reach 5CP. 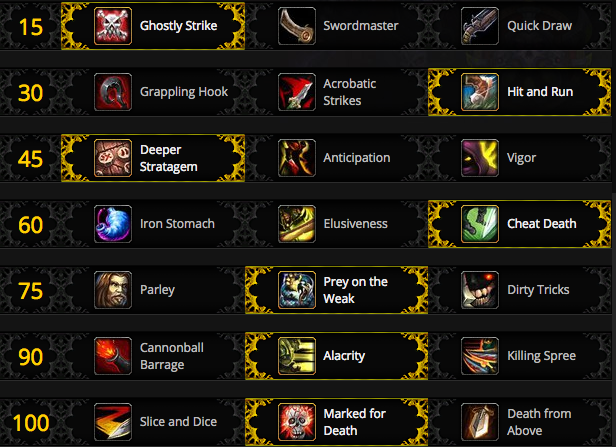 Then BtE to ensure the Blunderbuss proc is being enhanced. If you don’t have a Pistol Shot proc and your BtE buff is about to run out, you use a regular pistol shot to consume the buff. 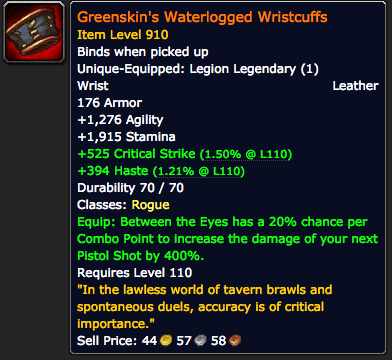 So, all that being said even though Greenskin’s is getting nerfed from 400% to 200% it’s still going to be the best ST legendary for Outlaw. No legendary should be much more powerful than the others. A nerf was justified and it’s still going be a BiS legendary.